MANILA — When Angela was seven years old, her mother attempted to kill herself (but survived). To cope with the devastating psychological torture of this unforunate event, she decided to list down every little thing that made life worth living for. She would regularly let her mom read her list of her favorite things to distract her (both of them actually) out from her depression. Her list began simply at number 1 with ice cream, written in a sparkly pink notebook. But with time, as Angela grew up, went to college, met her boyfriend Sam and got married, the list grew and grew in number, from 200, to 1,000, later well into six digits, with the items becoming increasingly specific and abstract. There had been a number of plays recently about the very serious topic of suicide. 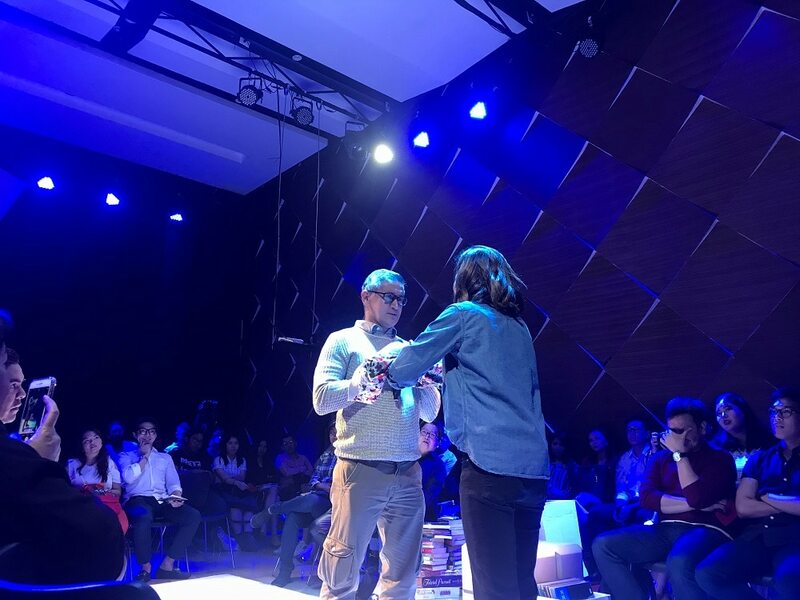 In 2016, Twin Bill came out with Andrew Hindraker’s “Suicide Incorporated.” Last year, PETA staged Ian Lomongo’s Filipino adaptation of Marsha Norman’s “‘Night, Mother.” Both plays were deadly serious, with humor just sprinkled in occasionally to break the intense tension of the scenes. This newest production of the Sandbox Collective (on its fifth anniversary) in cooperation with 9 Works Theatrical (on its 10th anniversary) takes on the topic of suicide again, but this time in a particularly unique style. “Every Brilliant Thing” was written by playwright Duncan McMillan (who also wrote “Lungs”) and comedian Jonny Donohoe as a monologue for one actor (either male or female), and involved the audience seated around the stage to engage in various interactions with the actor. The surprise sponteneity of this set-up assured that every single show will have a different charm and humor from the last. For this show, the producers of Sandbox Collective had chosen to feature a female central character. 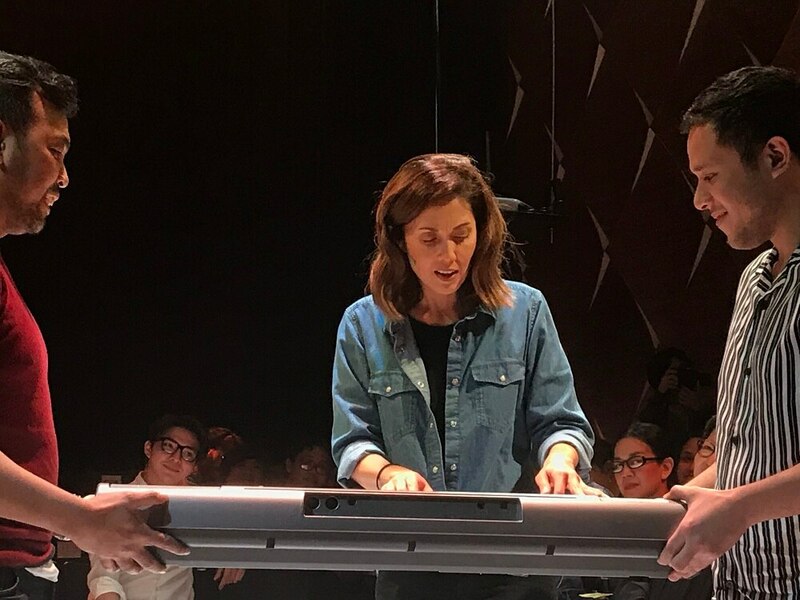 I thought this was a wise decision because a female lead can connect better with a Filipino audience given the emotional nature of the script. Angela was played by film and stage actress, TV host, and fashion model Teresa Herrera. The last time Herrera acted on the local stage had been way back 2011, and I had not seen any of ther past performances until this, her comeback project. Wow, she was so natural and carefree in her performance, as if she were not acting at all. The international dimension of her career (in New York, Hollywood, UK, South Africa, aside from Southeast Asia) reflected in the well-enunciated delivery of her lines. Herrera had to be a good judge of who among those seated around her would be able to deliver extemporaneous lines effectively. It is certainly not easy to tell a person’s personality or the quality of his or her voice merely by looking at his or her face, so this choice was really just a matter of luck. Her audience picks for these supporting characters greatly influence the fun and flavor of the rest of the show. 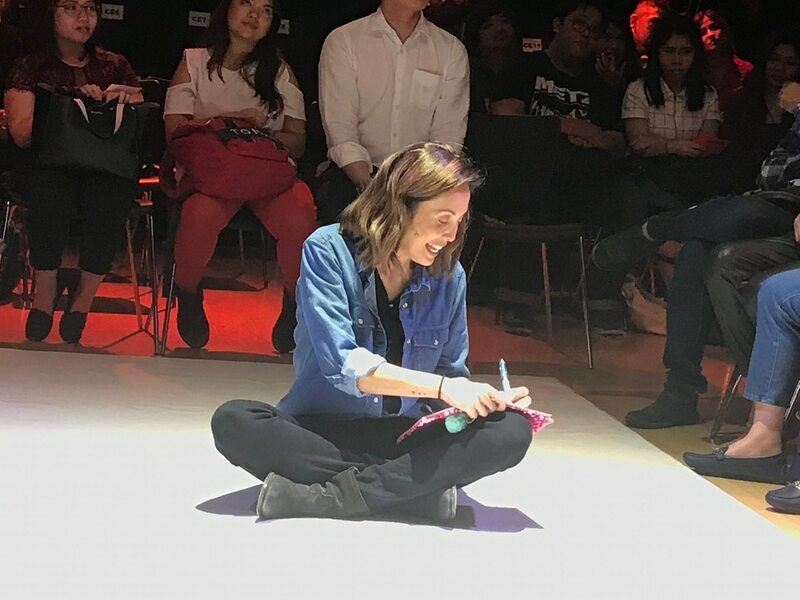 Before the show, almost everyone else in the audience was given a sheet of paper where an item on Angela’s list was written. Throughout the play, Angela would call out different numbers, and that member of the audience should read his or her card out loud. Some cards contained a single word, while some were entire sentences. Now this was a hit or miss part of the play because not everyone can read clearly or project their voices well without a microphone. There were several instances when I could not understand what was said, which was a real pity because I feel that I was missing out on some of McMillan’s witty thoughts. Since I entered the theater late, I did not have a card to read so I missed out on this interaction. Kakki Teodoro will get to play Angela in at least two Saturday matinee performances (February 9 and 23). Teodoro is also an associate producer of this show. Leading the creative team is director Jenny Jamora who had also lent a lot of her personality on how this play was presented. John Batalla designed the lighting effects. Arvy Dimaculangan’s sound design included a lot of eclectic music choices, from Ray Charles to Chicago to Gustav Mahler, on vinyl. 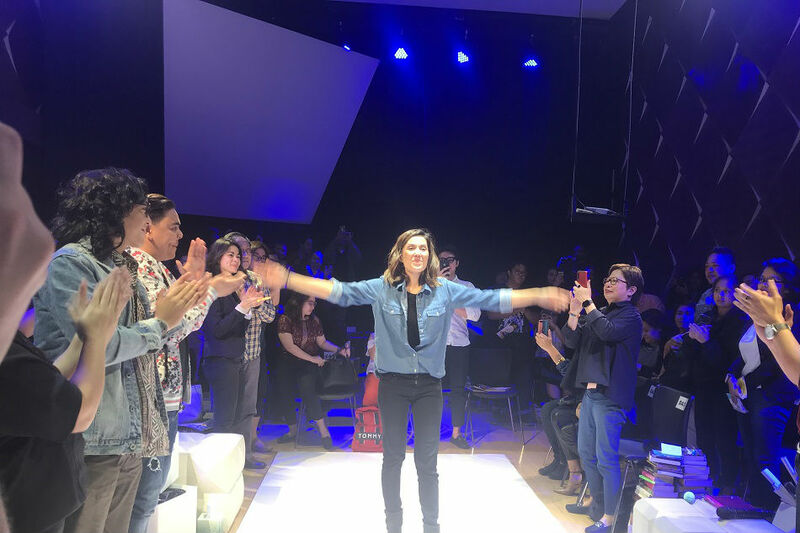 Marta Lovina’s production design borrowed from the Sandbox production of “Himala the Musical” last year where props (this time Angela’s numerous books and boxes) were scattered even in the audience areas in the round, so further draw the audience in the action. Suicide will always be a touchy and morbid subject matter. “Every Brilliant Thing” manages to present it to in a lighter manner to engage the audience more. However, there were serious reminders about how to deal with the tragedy, particularly directed to practioners of mass and social media about how to cover suicide cases. There was also a talkback session after the show to discuss concerns about suicide with guest psychiatrists and mental health specialists. Suicide is certainly a negative event, but a play about it need not be without positivity. “Every Brillant Thing” runs until February 24, 2019, with shows at 2:30 pm and 7:30 pm on Saturdays and Sundays. Venue is at the Zobel De Ayala Recital Hall of the Maybank Performing Arts Theater, Bonifacio Global City.